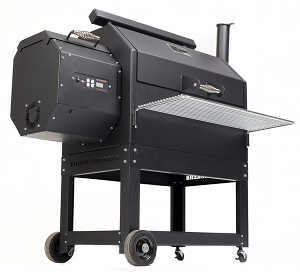 Yoder pellet grills are available in two models, the YS480 and the YS640. The model numbers relate to their cooking areas in square inches. These units have an excellent build quality. The hopper and cart use 14 gauge steel, while the cooking chamber is made of ten gauge. Design is of the 'form follows function' school, well thought out with ease of use in mind. The cooking chamber even has a counterbalanced lid so that it opens easily. As well as the digital control which uses a thermocouple in the cook-box, there is an easily red thermometer in the lid. The whole of the grill is finished in high temperature urethane. 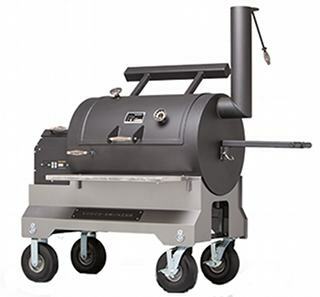 Yoder pellet grills have an exceptional warranty, with the grill body being guaranteed for ten years, and the control systems guaranteed for three years. Cooking area 480 sq. ins. 20" by 24". Second shelf, 312 sq.ins, 15" by 19". Dimensions H 52" W 50" D 33"
Temperature control Digital, with a thermocouple in the cook box. Adjustable in five degree increments. There is also a thermometer on the hood. Sliding second shelf, 15" by 19". Cooking area 640 sq. ins. 20" by 32". Second shelf, 416 sq.ins., 15" by 27". Dimensions H 52" W 58" D 33"
Sliding second shelf, 15" by 27". Here's a bit of kit that Yoder have designed for professionals. 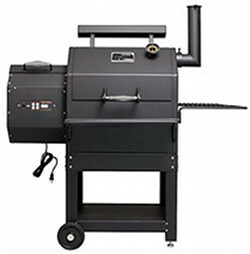 Heat management allows differing temperatures from side to side of the grill. The lid has a counterweight and the trolley has large locking castor wheels for manoeuvrability. Vast cooking area. Design inspired by Stephenson's Rocket. Cooking area 1320 sq. ins. Dimensions H 67" W 58" D 37"